So Ana and Thea of The Book Smugglers fame tapped me for their August Guest Dare. This is an awesome monthly feature in which they dare another book blogger to read a book in a genre they don't usually read and then review it on their site. Since Ana is a big romance reader, and I'd never read a romance before, they dared me to read Mr. 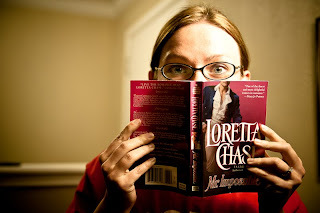 Impossible by Loretta Chase! Despite a certain amount of trepidation, I rose to the challenge and today I am guest blogging over there with my review of Mr. Impossible. If you get a chance, please drop in to see what I thought of my very first romance novel! Oh such a lovely , awesome picture!!!!!!!!!!!!!! Ana, lol! I love having a husband who's a photographer. Juju, thanks! It was a lot of fun. Even if I cringed and snickered my way through of couple parts. Thanks for "girding your loins" (!) and writing about your experiences! Dannie, yeah, for some reason when things get descriptive in the wrong way it pulls me right out of the story and it's not romantic anymore. I don't know why this is the case for me, but it is. I did have fun, though, and I'm going to take Ana's next romance rec (based on my response to this one) and one from Diana Peterfreund as well and give them a whirl. What a nifty idea! Glad you go to participate! Haven't read a romance.. that's like.. crazah. I feel like you'd prefer contemporaries better than historicals though. Maybe. Janssen, it is, isn't it? Love those gals. Janice, lol. I know. I shall have to give a contemporary a shot. Any suggestions? Jennie, see, I wasn't sure! I'd always seen them categorized as mystery or romantic suspense. So I guess when I was referring to straight romance, I meant a book in which the romance is the main vehicle or sole point of the story. Stewart's books always felt like there was more to them...But I am no expert certainly. Contemporaries I'd suggest: well Bet Me by Jennifer Crusie is the book that is ALWAYS suggested (because it's good). I loved that one. I also liked the two Julie James books out (those are more like B, B+ books than As though). Janice, hm, haven't heard of BET ME. Lol, I know, big surprise. I'll definitely look it up.